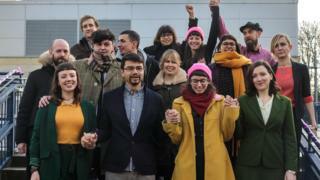 The court service has apologised to members of the so-called "Stansted 15" for mistakenly summonsing them back to court over the same offence. The group was convicted in December after members broke through a fence at the airport in a bid to reach a jet deporting 60 people. They were sentenced earlier this month but then received a summons for a hearing in April. HM Courts and Tribunal Service said it was "incorrectly listed". The group used bolt cutters to enter Stansted Airport in March 2017 and attached themselves to the Boeing 767, which was due to deport people to to Nigeria, Ghana and Sierra Leone, using tubes and expanding foam. The runway was closed for more than an hour and 23 incoming flights had to be diverted. Members were found guilty at Chelmsford Crown Court of endangering the safety of an aerodrome and received sentences on 6 February ranging from suspended jail terms to community orders. But after that, they received letters summonsing them to Colchester Magistrates' Court on 15 April charged with aggravated trespass. A court service spokesman said: "We apologise for any inconvenience this may have caused and the hearing in April will be cancelled." Raj Chada, partner at Hodge, Jones & Allen, which represents the Stansted 15, said the retraction and apology "doesn't take away from the misery that our clients suffered over the weekend". The group has said they will appeal against their convictions.